Negotiations have broken down between the Grenada Tourism Authority Transitional team and the Technical and Allied Workers Union as Government prepares to establish a new marketing and promotional institution. Under the new format, workers of the Grenada Board of Tourism are expected to become redundant but it is expected that they will receive first preference through an application process for jobs when the new Grenada Tourism Authority is created, but in the interim a core group of workers will remain as part of the change process. On Monday, workers at the GBT under the collective agreement of the TAWU began picketing during their lunch hour, to express their disgust by the state of the negotiations. On Thursday morning, Chester Humphrey, President General of the Union was not specific as to root of the contention but gave the assurance that all parties will be meeting with the Ministry of Labour. “We are all meeting this morning. The matter was sent to the Labour Commissioner but in the meantime workers will be continuing as we did yesterday,” he said. 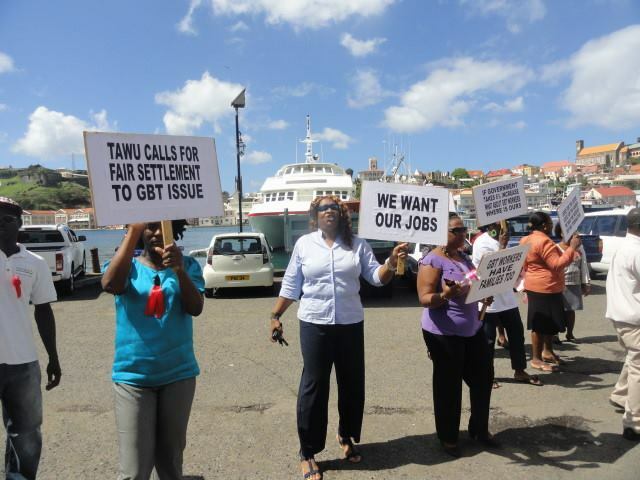 In a statement issued last Wednesday, the Ministry of Tourism said that the Government respects the rights and privileges of all workers in Grenada, their right to association and indeed to protest — and was surprised at the decision. However, the Government and in particular the Committee that has been set up to oversee the establishment of the Grenada Tourism Authority — an organization that TAWU has fully endorsed and supported — has not at any time during this process sought, in any way, to disadvantage the staffers of the GBT. On the contrary, the principals of the GBT, as is the practice at all times, has been conducting the most cordial and respectful of negotiations with TAWU. Always respecting the tenets of the collective bargaining process and seeking to be fair to all concerned. “It therefore came as a complete shock to the Principals of the GBT and the members of the committee charged with overseeing the creation and establishment of the GTA, that negotiations had broken down to the point where any kind of industrial action was warranted,” said the statement. “It is even more disconcerting to the GBT and to the committee that in the midst of an ongoing and fluid negotiation process, and in particular regarding a matter central to the negotiations that has been referred to the Ministry of Labour for its guidance, counsel and resolution, that even before the matter has been heard this kind of action has been mounted,” the statement elaborated. “It is for this reason that we have followed the letter of the law in respect of the retrenchment of the Staff of the GBT and have agreed to compensate all employees in respect of their full rights and privileges under the Laws of Grenada and in particular the Grenada Labour Code, as it relates to the closure of a commercial entity and as prescribed in the Law of the land,” the statement said. The Grenada Board of Tourism was established by legislation and the new body will also be established by a legislation which is yet to be presented to the Parliament for approval by the Dr Keith Mitchell administration. It was initially presented during the former Tillman Thomas administration, but was withdrawn. The Authority is set to begin operations as of mid December 2013.